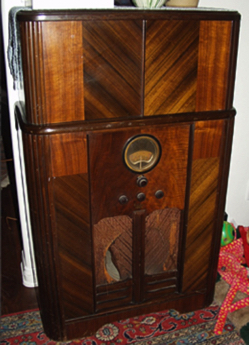 The factory style number of this cabinet is 50-9 and it is believed to be a 1938-only model. 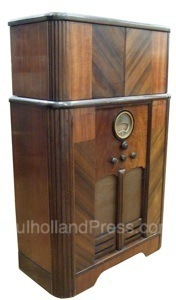 The model is fitted with a Philco 38-9 six tube chassis. The cabinet is 45.25” high, 39” wide and 13 3/4” deep closed. In open position the cabinet was 59” high and 62” wide. 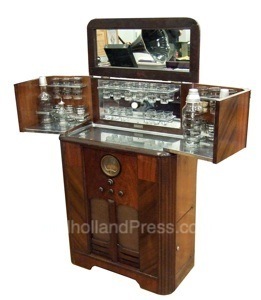 Bar equipment consisted of six each of the whiskey glasses, 5-oz. glasses, 10-oz. highball and Old Fashioned glasses. Additional items supplied were the glass ice bucket, muddler combination, and two liquor decanters.